Jamie Jeffery is an inspiration. 40 years old and killing it in Gateway. Kingpin brings us an interview and part from big popping Italian, Ale Cesario. 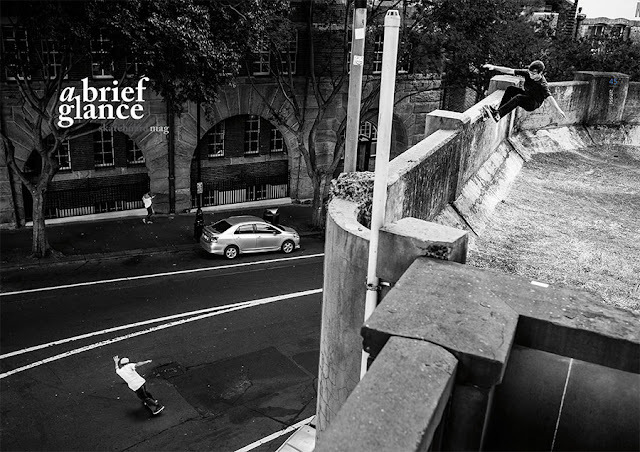 Banned is a Melbourne scene video by Leo Carroll-Capp featuring Casey Foley, Louie Dodd, and Raph Langslow among others. Spanish brand Caviar has a rugged and raw clip called Jovi1. Via: Dogway. From Windsor, Canada comes Gateway from Max Plantus. Jeff Srnec's part is a shining example of solid simplicity. The second installment of Place Magazine's Dit Is Berlin is here featuring Magnus Bordewick, Marcus Shaw, Pol Catena, and Niels Bennett. Check out part one and keep an eye out for part three next week. New Zealand looks awesome in Vortex from filmer Scott Rishworth. Featuring: Alex Sharman, Seamus Peters, Elijah Robertson, Mikey Gibson, Ben Hillenaar-Darby, Tiomai Kapoki, Kerry Wharekawa, Ollie Maclaurin, Callum Madgwick, Conrad Blain-Caunce, Jack Moon, Ben Morice, Leighton Dyer, James Kake, Jesse Abolins-Reid, Jesse Egden, Brett Band, Jake Darwen, Daniel Jochems, Conrad Jochems, Zach Wheeler, Cato Dobbs, and Simon Thorp. This might be the best video fo the year. Peep the trailer and wait with baited breath for the Evisen Video to hit. Germany's So Hot Right Now seems to have a new video even if they don't want to claim it as such. It features Paul Zenner, Matthias Flurschütz, Fabian Lang, Stefan Lehnert, Conny Mirbach, Simon Eff, Jonas Rosenbauer, Mark Metzner, Stephan Pöhlmann, Ben Rappel, Matthias Ellinger, Niklas Schaible, Maxi Schaible, Philipp Gürtler, Sergio Grosu, Fabian Gehring, Ben Wessler, Manu Wolff, Denis Klausmann, Dennis Rehm, Roman Lisivka, Vali Erlmeier, and Marlon Lange. Former Hampton Roads ripper, Kevin Love had the ender part in SICKhead and Transworld brought it to the web for your viewing pleasure. Russia's Absurd Skateboards teamed up with Carhertt WIP for a capsule collection and 3 weeks on the road for O3EPO. The 21 minute video features Igor Fardin, Felipe Bartolomé and Joseph Biais, alongside Absurd’s Tolia Titaev, and Gosha Konyshev shredding through 5 different time zones. The skating starts at around 6:39 and again at 13:40 in case you wanna skip to the action. Filmer Henry Forsnor brings us a montage from Malmö featuring the next generation. Japanese brand, IFO brings is Second Cosmic Velocity, a 20-minute video featuring Iku Denda, Takashi Yamaguchi, Hiroki Takamura, Kaito Nakata, Kazuhiro Hiroki, Riku Kanemoto, Shunpei Sato, Hitoshi Tateishi, Hiroto Naito, and Kaito Sagawa. Via: VHS Mag. Lots of rad skating in Tony Karr's part in Heroin's 2015 video, Bath Salts. Palasonic, the new Palace Skateboards video is here. One of Virginia's best shops, Cardinal just welcomes Leif Hauge to the team. From the looks of the video, it was well deserved. Virginia homie, Mitch Bonadies is working on a video called Obscure Purity. Peep the promo and look for the full video in 2018. Italy's Meaningless Productions hits us with Fitta, featuring Pietro Bontà, Federico Casella, Oscar Zota, Francisco Andara, Mattia Turco, Nino Magana, Cheesy, Ruben Spelta, Alberto Bottazzi, Fabio Spalvieri, Iuri Furdui, Alessandro Benedetti, Pietro Tirelli, Ruben Luzzato, and Raffaele Pola. Via: A Brief Glance. Hampton Roads homie, Tyler "Sned" Snedeker killed it in East Toast. Peep game. Japan's N.T.Original introduces us to Daisetsu "Andrew" Araki. Pleased to meet you. Via: VHS Mag. Slam City welcomes Jak Pietryga to the team with a minute of footage.